Addis Ababa (colloquially simply known as Addis) is the capital city of Ethiopia. With a population of 3,384,569 (2007 census), the city is the largest in the country. Many of the wealthiest people live in the southeast (Bole), southwest (old airport), CMC, Ayat and Lamberet parts of town. There are more than 120 international missions and embassies in Addis Ababa, making the city a hub for international diplomacy concerning Africa. The headquarters of the African Union and the UN Economic Commission for Africa (UNECA) are both in the city. The European Union and the United States both have two delegations in Addis Ababa, one for bilateral relations with Ethiopia and one for the African Union. Temperatures in Addis Ababa are remarkably constant from month to month. The average highs are between 17°C (63°F) and 22°C (71°F). The average lows are between 11°C (51°F) and 14°C (58°F). The warmest months are February to May. Temperatures and climate can vary due to elevation. Due to altitude there is a huge day to night range of temperature: It is often 27°C (81°F) at lunchtime and 3°C (37°F) at night: Evenings in Addis always take a second layer of clothing with you. Bole International Airport (IATA: ADD), the busiest airport in East Africa and the hub of Ethiopian Airlines, is serviced by several international airlines with daily flights to Europe, United States, and Asia as well as inter-African destinations including Accra, Bamako, Brazzaville, Cairo, Dakar, Dar es Salaam, Djibouti, Khartoum, Harare, Johannesburg, Nairobi and many more cities in Africa. Turkish Airlines has daily flights from Istanbul to Addis Ababa. There are two terminals. T1 (the older, smaller one) is for all domestic flights and most flights to neighbouring nations (but not Kenya). T2 (the newer 2003 building) is for all other international flights - arrangements may change so check first. As of July 2012 access into the terminals is restricted. Anyone at the airport to meet you, plus taxis, will be out in the carpark. A dozen of the top hotels still have a booth inside the arrivals area. Similar rules apply at the other airports in the country, for both arrivals and departures. Most hotels will pick you up for free - inquire at booking. One month single entry visa on arrival costs 50USD while three months costs 70USD, note that it is impossible to apply multi-entry visa in the airport now. (2016 June). Most of the roads are in good condition. Autobus Terra near Mercato. This is the main bus terminal where most of the national buses arrive and depart. 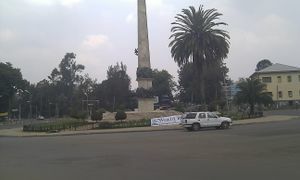 Meskel Square (formerly from the railway station). Buses to/from Adama (Nazret), Debre Zeyit, Dire Dawa, Nairobi, Lalibela, Shahemene, Awasa and Bahir Dar are here. Buses west to Nekempte and beyond go from ASCO on the old Ambo Road. Services on the old metre-gauge railway between Addis Ababa and Djibouti via Dire Dawa were cancelled in 2008. A new standard-gauge railway has recently been built; passenger services from Djibouti via Dire Dawa, Awash and Adama to Lebu and Kality were inaugurated in 2017. Streets increasingly have names, but the names are not widely known or mapped; use landmarks to navigate the city. Addis Ababa's light rail transportation system - the first of its kind in sub-Saharan Africa - opened in 2015. There are two lines - an east-west line (Green Line) and a north-south line (Blue Line). The Green Line stretches 17.4km from Ayat Village to Torhailoch, and passes through Megenagna, Meskel Square, Legehar and Mexico Square. The Blue Line stretches 16.9km from Menelik II Square to Kality, passing through Merkato, Lideta, Legehar, Meskel Square and Gotera and also serving Autobus Tera. Trams operate frequently 16 hours a day, 7 days a week. Tickets are exceptionally cheap - costing 2-6 ETB depending on distance travelled - and can be bought at orange-coloured kiosks next to each station. All signs and pre-recorded announcements are in Amharic and English, so there are no language barriers for the English-speaking traveller. Most conductors do not charge foreigners more than locals but it is not uncommon to hand over a 10 birr note and receive only 5 back for a short trip. Another way to go is to offer exact change, say 2 birr and then pay more if asked. There will be no hard feelings. Blue and white minibuses/taxis travel quite efficiently around the town. Since they are full of people most of the time, it is very cheap too, usually between 1-3 Birr depending on how far you are going. To catch a minibus, stand on the side of the road and hail it. This can be done anywhere it is possible for the bus to stop. The conductor inside will call out the destination, and if that's where you want to go: get on. You pay the conductor when he signals to you that he wants money (which might take a few minutes) to get change. To get out say "woraj alle", or just "woraj". It is worth having an experienced guide with you if it is your first time using these taxis, since it can be quite chaotic to find out which minibuses go where, and from what places. It is acceptable to ask if the taxi (minibus) will go by your destination on its way. For example, if you want to take a taxi from Bole road to Black Lion Hospital (Tikur Anbessa) you can hail a taxi headed to Piazza (which the conductor will be yelling out the window but it might sound like 'assa! assa!') and when he stops ask 'Tikur Anbessa?' using a rising tone to indicate the question. Usually he or another passenger will nod. Often if you do this the conductor will stop the taxi at your destination without you even needing to request the stop. It also serves to allow the conductor to determine how much to charge you. Indeed, one of the main challenges to using the taxis is recognizing the name of your destination being yelled from the window. Don't hesitate to ask folks on the street: "Taxi to Stadium?" and watch where they point. Small, blue coloured Lada taxis are more expensive. Negotiation is the norm and you often have to press quite hard to get a bargain as a foreigner. They can be contracted for a single trip, an hour, or a full day; just negotiate. Do not be surprised if the price of the taxi increases at night for the same trip. Airport to city is now 160-250 birr (haggle!). Yellow and green taxis usually hang around hotels like the Sheraton. They are more expensive, but reliable, and if you're willing to pay for peace of mind, slightly better drivers and a car that wasn't featured in the Flintstones (comfortable ride and vehicle usually in good working order). Use these cars. 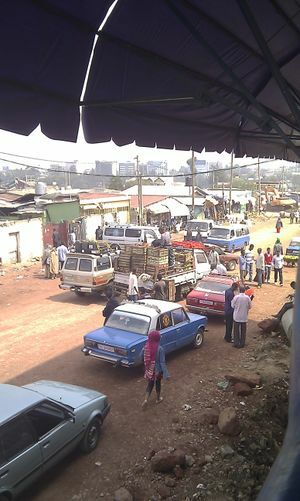 Walking in Addis Ababa is a pleasant and sensible way of getting around. Locals will happily greet you, ask you how you are doing and so on. Hiring a car for a day-trip will be quite expensive as well: 600 birr. Remember, it's only 20birr / liter for gasoline. 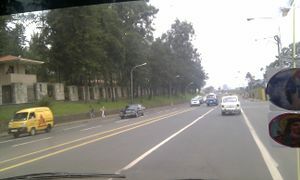 Addis Ababa is the starting point of the famous Ethiopia Historical Circuit. Reasonable service providers include Ecotravel Ethiopia ☎ ++251 (0) 911-440-915" . 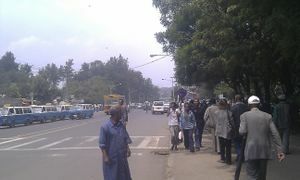 Walking along the street starting from Meskel Sq. to Sidest Kilo is very safe and entertaining. It will give you the chance to see the Africa Hall, the palaces and the Parliament building, the Hilton Hotel, the marvelous architectural adventure of a building hosting the Ministry of Foreign Affairs, the Sheraton Hotel, the first modern school (which Menelik the II built in the 1880s), the Trinity Orthodox Cathedral, the National Museum, and the Addis Ababa University (which also hosts a former palace and museum). Arat Kilo Avenue is marked by a statue built in commemoration of the Ethiopian V-day during the Second World War, while Sidest Kilo Avenue is marked by a statue commemorating the 39,000 residents of Addis Ababa killed by Italian fascist troops. Around Arat Kilo, you will find part of an old town known as Serategna Sefer (literally, the residential area of laborers). If you want to proceed past Sidest Kilo, the road becomes steeper and many of the attractions will be on the right side of the road. The Entoto College (previously Teferi Mekonnen School) and the American Embassy are found on this side of the street. After the American Embassy there is an open market called Shiro Meda where traditional craftsmen sell their homemade fabrics, pots and other crafts. The marketplace is at the foot of the Entoto Mountains that rise up to 3,300 m (10,827 ft) above sea level. You can take a taxi or a bus to the mountain unless you are of a mind to try it yourself. On the mountain, you will find the first churches of Addis Ababa called St. Mary and St. Raguel as well as smaller palace of Menelik the II. Walking on the mountain, especially between the churches, is refreshing and gives you the chance to see rural life, the city itself, forest and unbelievably beautiful landscape intersected by farmlands and trails of farmers. It is from here that Menelik II and Queen Taitu conceived of the establishment Addis Ababa. You can get a sense of the city plan yourself by looking from here at the current city. Other features of the city include the large Mercato Market, the Jan Meda Race Ground racecourse, Bihere Tsige Recreation Centre and a railway line to Djibouti, while the Entoto Mountains start among the northern suburbs. The Hager Fikir Theatre, the oldest theater in Ethiopia, is located at the Piazza district. Suburbs of the city include Shiro Meda and Entoto in the north, Urael and Bole (home to Bole International Airport) in the east, Nifas Silk in the south-east, Mekanisa in the south, and Keraniyo and Kolfe in the west. Entoto Mountain: walk from St. Mary's church, the first church of Addis and St Urael church and see the city itself from the top of the mountain. If planning to hiring a car - Never pay more than 300 birr for a taxi unless you hire them for the whole day and are making other stops. Walking is a great way to make it, but will take a good half day. Addis Ababa University is the largest and the oldest university in Ethiopia. It was originally named "University College of Addis Ababa" at its founding, then renamed for the former Ethiopian emperor Haile Selassie I in 1962, receiving its current name in 1975. Although the university has six of its seven campuses within Addis Ababa (the seventh is located in Debre Zeit, about 45 kilometers away), it also maintains branches in many cities throughout Ethiopia, leading to the claim of being "the largest university in Africa." The government assigns qualified students to these universities upon completion of secondary school. Students also attend other private colleges, such as Unity College featuring specialties in languages and business. MIDROC Ethiopia Technology Group has since absorbed the University as its 16th Company to be run under the leadership of the CEO,Dr. Arega Yirdaw as the President. Addis Ababa University was founded in 1950 at the request of Haile Selassie by a Canadian Jesuit, Dr Lucien Matte as a two-year college, and began operations the next year. Over the following two years an affiliation with the University of London was developed. There is also Theological College of the Holy Trinity, a theological school of higher education located in Addis Ababa, Ethiopia. It provides religious and secular education to both clergy and lay members of the Ethiopian Orthodox Church, seeking to be a center of theological and ecclesiastical study for all Oriental Orthodox Churches as well. Originally founded as a high school by Emperor Haile Selassie in 1942, the college division was added in 5 October 1960, and the elementary education section eliminated on 18 December 1961. The college became one of the chartered units of this first National University of Ethiopia. There is a high demand for IT professionals. Many start-up companies search for individuals with computer networking and consulting backgrounds. Addis Ababa has the highest number of NGOs in Africa, and possibly in the entire developing world. They are well known for paying good salaries to their employees. Unemployment in Addis: The last official survey conducted in 2010 by the Central Statistics Agency indicates that Addis Ababa's unemployment rate stood at 27.9% and . The underemployment rate is much higher, as many people struggle to earn a living wage. Many expatriates work in NGOs and small start-up IT companies. Compared to other African cities, Addis Ababa has a high number of large, medium and small sized computer training schools, governmental and private learning institutions. Many students who attend there hope to land an IT or consulting job in the very scarce job market of the city. Mercato. The mercato (Italian for market, as the main covered market still in use dates from the colonial administration of the late 1930s) is the largest outdoor market in the world, and you can get anything from tourist goods (t-shirts, wood crafts, etc.) to fabric to metal goods there. Haggling and bargaining are standard procedure, and foreigners (especially those of European ancestry) should expect to be charged higher prices. To ensure a positive experience, maintain a sense of humour, don't be afraid to negotiate aggressively, and above all don't let yourself be bullied by the many "brokers" who frequent the market, and will try to steer you towards certain stores in exchange for a kick-back from the merchant. You will be able to negotiate lower prices if you can avoid brokers, and especially if you have a local friend or guide to buy things on your behalf. Souvenir Street. Churchill Avenue going downhill from Tomoca cafe. A string of shops as you head downhill that are very reasonably priced and full of the same goods that you'll see at the airport, in Lalilebla, etc. Not much haggling is possible, but the prices are good to begin with. Shiromeda Market. Between Sidist Kilo & Mt Entoto. If the madness of Mercato isn't for you, Chiromeda is a pleasant alternative. Haggling and bargaining is still the status quo, but you could walk away with a traditional dress from as cheap as 100 ETB. Friendship Supermarket. Bole Road (airport end). Well-stocked western-style supermarket - and they accept Visa. (Both not to be confirmed in August 2011). Edna Mall on Telebole. Pretty good bookshop here, along with a Cinema stocked with Popcorn & Western Films. The center of the mall features an indoor amusement park with carousel, climbing tubes, and bumper cars; it's a fun place for small children, but really crowded on the weekends and holidays. Bambis Grocery & Department Store, Greek ownership, very good product. Also in Bishoftu (Debre Zeit) and Adama (Nazret). Shoa Supermarket on Bole Rd. ATMs/cash machines - are found throughout Addis Ababa and every main road will feature a bank or mall with ATM. The airport has several, one even before customs. Generally don't move with no cash buffer as power outages or TIA can kill a last-minute cash withdrawal plan. Food is generally cheap. Make sure you try the national dish Injera at least once, since there is no other food like it. It is is a yeast-risen flat bread with a unique, slightly spongy texture. It is traditionally made out of teff flour. In making injera, teff flour is mixed with water and allowed to ferment for several days, as with sourdough starter. As a result of this process, injera has a mildly sour taste. It's what the locals eat for breakfast, lunch and dinner. Most ordinary Ethiopian restaurants have it, and a serving for 2 people with free refills can be as cheap as 15 birr. Addis has hundreds of cake and coffee cafes. They sell various coffees, tea - black unless you ask for "machiatto" - and sometimes fruit juices. There are also juice beits. The cafes along Bole Road and around the Piassa area are of a high standard and relatively inexpensive. Most are very similar to each other. Most cafes serve the common drink called 'sprice juice' (which is just fruit pulp served in layers in a glass). There are usually three layers from a selection of avocado, mango, papaya, banana, guava etc. The juice is eaten with a spoon. It is colorful and tastes delicious. Single fruit juices are also great, such as orange, papaya, mango, and pineapple - beautifully fresh. 7 birr up to 25 birr in Hilton. Atelefugne Bar, Restaurant & Rooms- Kera, Bulgaria area exactly across from Dashen Bank. Beyaynetu (Veggie Combo), Lamb Stew (mild or spicy), Tegabino (smoothed out chickpeas). All meals are less than 50 Birr. Definitely more for your money! Mili Firfir Ye Fikir Maad- Megenagna/Sholla, Opposite of British Embassy. Take a taxi from Megenagna towards British Embassy. Mili is on the opposite side of the road towards Sholla Market. On fasting days Firfir, Shirro and other vegan dishes. Normal days best kitfo for budget price (2 people - 125 ETB). Mili is a great host and will make you feel home fast. Mili has a facebook page (mili firfir) - you can check out the location and some pictures. Yemi Burger- Haya Hulet. Burger, Fries & Mirinda/Coca Cola for 23 ETB. Wonderful staff! Known by many expats. The best chips in Addis. Cafe Chocolata on Victory Road (near Shoppers Mart supermarket) serves drinks and snacks and is very nice. All the staff are former street girls and prostitutes who are trying to make something of their lives. City Cafe on Bole has delicious cakes and pastries as well as high quality Ethiopian espresso coffees. 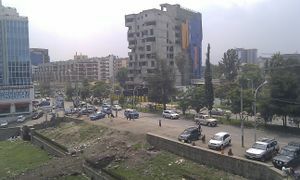 You can sit on the porch and watch the activity on one of the main roads in Addis. National Cafe in the National Theater building, at the end of Churchill Ave. Reasonable prices and good food. From Injera to Club Sandwich. Restaurants that do not have an English menu are cheaper. Example: Connection between Bole Road and Tele-Bole, next to Bole roundabout, at NOC-Fuelstation, close to German Kantine. You can have lunch (local food, spaghetti) for less then 20 birr. If you don't have a translator, ordering is a lot of fun. Lucy's Restaurant Outside of the National Museum. This pleasant restaurant offers surprisingly good Ethiopian food and great juices at reasonable prices. A great place to stop for lunch after visiting the museum. Habesha. Bole Rd. This cultural restaurant has traditional singing and dancing at night. If you're feeling brave, try the gored gored (cubes of heavily salted and spiced raw beef). Waiters are well mannered and kind, and most are very talented dancers. Sana's place on Gabon Street near Bole road is a very popular restaurant with amazing Yemeni food. Meda Bar and Grill, (on the way from Addis Ababa Stadium to Gotera around Lancha). Bar and restaurant, clean with many selections of meals, cocktails and a wine bar. Team Mini Bole Rd. Friendly, high quality restaurant with traditional Ethiopian food. Try the mesir besiga (ground meat with lentils). Performances by traditional singers and dancers at night. The entertainment is not as good as that at Habesha, but the food is generally better. The Limetree. Bole Rd, Boston Partners Building. While Ethiopian food is delicious there comes a time when you might want to try something else. Extensive menu, ranging from Arabic to Ethiopian food. They do have a consistency which is quite hard to find here. Own brand of coffee, which is a bitter version of the Ethiopian coffee you find, but if this appeals to you then you can not find this coffee anywhere else. Addis Cuisine. Wollo Sefer. (Bole end of Ethio Chinese Friendship Rd,on the north side of 6 lane road). Good western and Ethiopian food. Pizza Deli Roma. Bole Rd, (coming from airport, go to the right (pass Alizee Club), after about 50 m on the right side; Bole Road on the left side on the way from Demble building to Meskal square). A chain with at least 3 locations. One of the best pizzas in town. Brick-oven Pizza across the street from Wanza Hotel has an amazing green chili sauce. Kaldi Coffee with a sign similar to Starbucks on Bole Road has great porridge. Liquid Lounge* Located at Nigist Towers near the intercontinental hotel at Kazanches, they have taken the approach that people want a quick but delicious lunch with lots of variety. outdoor cooking on the stir fry wok allows you to assemble your own dishes, while the ala carte menu offers a few burgers, sandwiches and other lunch items. The portions are sized to fill you up, and if you want a lighter lunch the soup of the day, or anything from the tapas menu will leave you waiting for lunch time the next day. The food is great during the night and day but the atmosphere changes from a casual patio lunch with the outdoor BBQ and draft beer during the day, to a more hip, smart casual lounge at night. Yod's Abyssinia. A well-known dinner theatre that is full most nights and popular with both the middle class and tourists (buses pile in here). Food is not very good and highly overpriced (3x other restaurants), but the reason you come here is for the show that features 12 different dances and live music from the different cultures across the country. Very out of the way and will require a taxi, but worth it for the show (get a coffee ceremony here, not dinner). Fisherman Restaurant. Mickey Leland St, (near Atlas Hotel). Is a half-Chinese, half-Tibetan restaurant specialising in seafood and serving an excellent range of Asian cuisine..
Aladdin Restaurant. Bole Rwanda. Serves Middle-Eastern food. Very expensive but authentic and delicious. Castellis in Piazza. Top Italian restaurant here since 1942. With famous guests like Angelina Jolie, and Brad Pitt, there is a reason that Castelli's manages to draw in such a crowd. Amazing food, amazing desserts, call for a reservation or risk disappointment, even at lunch time, as this is a trendy place to be seen. Top View Restaurant. (past Bole airport near Gutara). Very good food but can be expensive for a dinner meal. Green View Italian Restaurant / Pizzeria Bole Mickey Leland St, (near Atlas Hotel). For an excellent pizza. There is another location near CMC. Serenade Restaurant, (in the Ammest Kilo area, close to Nazareth School, yet a difficult place to find) Will need a reservation. Amazing cous-cous. This has a middle eastern influence, but the desserts western and are amazing. Liquid Lounge: Teppanyaki, Bar and Grill. Opened in 2011. The food is impeccable. Tibs and the beef satay. They also have fresh sushi everyday. This place incorporates Japanese food, Tapas (appetiser plates) and the teppanyaki cooking where the Japanese trained chef cooks in front of you. The kitchen is open all night. Surprisingly, you get more then you pay for here..
Dreamliner Hotel. Best place for Indian food (although Sheraton is close). Decent variety of dishes, all cooked well. Luxury atmosphere. If you want to drink the national drink of Ethiopia, you have to try the 'tej' which brewed from honey. You can also try 'tela' which is like a beer. Tomoca Cafe. A small coffee shop near the peak of Churchill street that is famous among tourists and locals. Most maps have this marked off as the stop to come in and try some authentic coffee from the land where the bean was first discovered. for 9ETB you will get a delicious and incredibly strong jolt of caffeine that will fuel your trip to the souvenir shops nearby down the hill. The shop itself is quite small, but a must visit to buy some coffee to go (a great gift at 83ETB per 500g bag). Liquid Lounge. Kazanches, Nigist Towers Building, (right next to the Intercontinental hotel). Teppanyaki (food cooked in front of you) Sushi from fish imported everyday. Fairly expensive. This place is very trendy, they have VIP areas upstairs . On the weekends it gets busy. Champions, (across the street from Boston Day Spa building) . Hookah lounge with drinks and Turkish style atmosphere, makes for a nice relaxing night. Effoi. Around Bole Atlas. The pizzas and drinks are good. They used to have hookah, but I think they stopped. It's a good place to start a night out on the town. Gaslight. Fancy nightclub at the Sheraton. Inside, it feels like an upscale Western disco. Don't wear jeans or trainers/sneakers, as they have a fairly strict dress code. Although there is no entrance fee, be prepared to pay heavily for drinks. Memo. This club is popular for its late night atmosphere. This club is one of the few that charges admission and be warned about the price they charge you for drinks . However the music is loud and good, the kitchen is open late and it makes for a great night. Club Deep. The cover charge is small, but the drinks are inexpensive. However it is better to not go to the bathrooms here as they are filthy beyond belief. Meda Sports Bar and Grill. Near Global Hotel on the Debre Zeit Road. Large, spacious bar which is comfortable for chatting or watching a game. The downstairs lounge provides a more intimate setting for quiet conversations. And upstairs, the loft has a relaxed, casual dining atmosphere. The Black Rose. A lounge that is dark yet comfortable and fashionable, and the bar serves a variety of drinks. Divine. Bole Rd, (on the top floor of Sheger House). Very western-oriented playlist along with ample space for relaxing and a pumping dance floor on weekends. Bailamos. Bole Rd, (on the top floor of the Novis building). Club with a surprisingly vibrant salsa scene on the Weekends. Live music every Saturday, soft rock, salsa, R&B, and the band is surprisingly good. However, this is considered a lower end club, more targeted to those with a limited budget such as college students. Dome Club. Concorde. 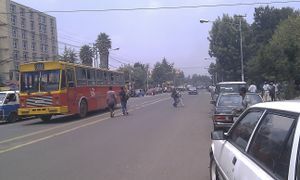 Debre Zeyit Rd. Sticky and dark, more of a dive bar/club. Illusions. Dance till 5AM. Very crowded on weekends, yet that adds to its charm. NOTE: The Ethiopian dialing plan changed on 17 Sep 2006. Six-digit telephone numbers changed to seven digits. Many of the accommodation listings here appear to still have the older 5 digit numbers following the country code of +251 and the city code of 11. Addis Ababa local numbers should contain 7 digits. Please check the number before calling and please plunge forward and update any numbers that are incomplete. Usually prices for low budget accommodation are better in the capital, because there is more competition. This is not the case in Addis. Few new places have emerged and existing hotels / pensions just raised their prices without providing better services. Prices range for the cheaper places is from about 175 to 250 Birr for a single room with shared facilities (Feb2018). Taitu Hotel, Piazza, (opposite the National Lottery Authority Head Quarters). Annexe with cheap rooms, but you have to explicitly ask for it. Excellent value for money, very quiet, but toilets and shower are in despicable condition. The main building is the oldest stone-building in Addis. In the reservation-building they have "one-hour-rooms", so expect strange noises when you sleep in this building. Singles start at 200 Birr. Wim's Holland House, near the old Railway station / Legehar station in downtown Addis at walking distance from Meskel square. Many long-term travelers and overlanders on motorbike or bicycle stay here. Basic facilities, but clean and comfortable. Friendly staff. Restaurant on site, and hot water showers. Wifi works well. From 175 Birr (single, shared bath/shower). Abrehams Hotel, Piazza. A dump, but has rooms when the others are fully booked. Single rooms start at 250 Birr. Filwoha Hotel, near the hot springs, ☎ +251 11 511404. Fin-Fin Hotel, (opposite the Filwoha Hotel). Hawi, Debre Zeit Rd, (south of the city centre). Holiday Hotel, Haile Gebresilassie Rd, (near the Plaza Hotel). Yordanos Hotel, Haile Gebresilassie Rd, ☎ +251 11 515711, fax +251 11 516655. Atelefugne, Kera, Bulgaria area, exactly across from Dashen Bank, Walking distance from African Union Headquarters, ☎ +251 14167342. +251 91 2190328 +251 91 3188460, (). Terrace with a view, friendly staff and convenient. Restaurant on site, and hot water showers. From USD 18 (single, shared bath/shower) USD 30 (spacious en-suite). Includes breakfast. 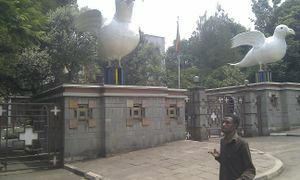 Worku Bikila Hotel Dukem, (about 20 km south-west of Addis Ababa) ,, Thriving hotel for budget to mid-range travelers. Addis Regency . Located in Old Town nearby St. George's Cathedral and walking distance from many places in the North. Outstanding service in a modern and clean space with helpful staff. Free wifi, breakfast, and airport pickup. If you arrive early, they will even let you check in without surcharge assuming rooms are ready. $75/night is quite expensive for Ethiopia, but I thought worth it. These guys are #1 on tripadvisor for a reason. Axum, Haile Gebresilassie Rd, ☎ +251 11 188832. Martin's Cozy Place-German Guesthouse, (near the Atlas and almost opposite the side of the hotel). A favorite for business people or expats having to base themselves in Addis. Martin offers a range of services for tourists and it is a homey place to shack up for a few nights. It costs around Birr 150/170/250 single/double/triple or 345 for a family room. Bourgainvillier guest house, ☎+251 911 627898, [www.ethiopiatjazz.com]. Has small rooms but it is clean and athlete Haile Gebre Selassie sister, Azaltich Gebre-Selassie offers nice hospitality. You need to book in advance. .
Yilma Hotel, Mekanessa area. This hotel is about US$25 per night for tourists. Restaurant/cafe with cableTV that plays news and sports channels. They serve food until 10:00-23:00. The staff are friendly. Offer room service for no added charge. The rooms are minimal but have decent bathrooms with hot water heaters for the shower, flush toilets and tiled floors. Addis Ababa Hilton Central Menelik Ave, ☎ +251 11 518400, fax +251 11 510064,  [,. Airline agents, money changing, restaurant, bar, gym, sauna, swimming pool, internet access. Carrera Lodge, Rossevelt St, ☎ +251 11 517400, +251 11 447400. Dimitri Hotel, Yeka district, . Peaceful surroundings in contemporary city area, opened 2008. Many free services,including in-room wireless internet and satellite TV. Ghion, central Menelik Ave near Maskal/Abbiott Square, , ☎ +251 11 513222, +251 11 443170. It is not on Menelik Ave. It is on Ras Dasta Damtew just out of Maskal Square. Ras, Church Rd, (just North of the railway station), ☎ +251 11 517060, +251 11 447060. One of the oldest hotels in Addis. Be aware of your belongings on Line Taxis: They usually get very crowded - keep your wallet/phone/bag close to you. The major and important roads and areas are patrolled by the 'Federal Police' or, as the city residents refer them Federal. They have a reputation of being merciless with suspected criminals. In contrast, the Addis-Ababa city police, who most of the time patrol the less important city streets, markets and neighborhoods are more tolerant and less respected police officers. For all emergencies ☎ 991. In Addis, major streets are generally safe at night. One problem, especially near Meskel Square and Churchill Avenue, are packs of stray dogs which may gang up on you, follow you around, bark at you, and even charge at you. Since many coaches leave from Meskel Square before dawn, it may be wise to take a cab there instead of walking. Blackouts are frequent. Because of this it is advised to carry a torch at night. Also note that there are many uncovered manholes in the pavement. As an extra precaution, don't withdraw money from (unguarded) ATMs after business hours, since there's no way of retrieving your card if electricity fails during a transaction. In a total difference of other African cities, in Addis-Ababa, police officers never approach foreigners to ask them to present a passport, ID or "legal" papers. Once you show your passport at the airport, you are free to move around pretty much anywhere. The only time you need your passport or ID is for hotel registration (booking) and other similar and few instances. (It is important to have your ID with you at all times, however.) Many visitors appreciate that they don't have to be questioned who they are or where they are from by a police officer who wants to extract bribe money from them, every time they turn around. This could be one of Addis-Ababa's appeals. As opposed to other cities in Ethiopia that rely on tourism, you can walk around hassle free in Addis Ababa without school children coming to beg for money. Scam "Fird Biet". You will be approached on the street by a nice looking gentleman or even a kid. They tell you that the local community are putting on a Cultural Show and they would like to invite you. There will be traditional dancing, including the snake dance, by dancers in authentic costumes. It sounds great doesn’t it? Well, it’s a scam. A complete fraud and criminal enterprise. How does it work? They take you somewhere and a few dances are performed. You are offered drinks. You are then asked at the end for $100 per person or even more. Because they kept their end of the bargain you have to pay. Not paying could become violent. Never, ever go to a ‘Cultural Show’. If you eat at a good Ethiopian restaurant you will get traditional dancing for free. If you are approached, just say “Fird Bet” and they disappear quickly. By the way the term means something like an appearace in criminal court. Watch what you drink or you can fall sick. It is important to remember to only drink bottled water. There are many brands to choose from; always check the plastic seal on all bottles before paying any vendor. Most travelers should be warned against eating vegetables such as those in salads that may have been washed in water. Try limiting fruits and vegetables to those you "peel" yourself such as oranges, mangos, etc. Be prepared for culture shock. If you take photos of the people, ask first and offer to show them their picture if you have a digital camera with a display screen. Children enjoy seeing their pictures a lot of the time! Your emotions are real. Many first time visitors may feel overwhelmed if they have not experienced this type of culture difference before. Be polite but not intrusive. It is OK to ask questions of the locals, but you should be prepared to be hassled a lot of the time, especially if you are white. Additionally, for foreign travelers who are black, especially American, although possibly able to "blend in", precautions are the order of the day (depending where you are, in Addis on Bole road they are used to seeing foreigners compared to the country side). If you prepare your mindset before arrival, you will be better able to cope. The country code for calling Ethiopia is 251. The Ethiopian dialing plan changed on 17 Sep 2005, such that the two-digit city code changed to three digits (or, from outside the country, one to two digits) and six-digit telephone numbers changed to seven digits. 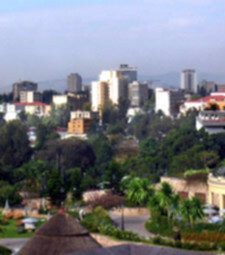 The city code for Addis Ababa, as of Sep 2005, is 011 (or 11 from outside Ethiopia). Ethiopia uses GSM network and operated by Ethiopian Telecommunications Corporation. Currently there are decent coverage around big cities such as Addis Ababa, Dire Dawa,Bahir Dar, Debre Markos, Dese, Gonder,Harar, Mekele, and Nekemete. It is expanding into most small cities. Roaming charges are very steep. For a short visit, your best option for mobile access is to rent a SIM card with a phone. Only a few stores rent SIM cards: You can rent SIM card and phone inside Addis Ababa Sheraton hotel but it is very expensive. Another option is to rent a SIM card and mobile phone from local stores (for example Red Zebraes, ). A third option is to buy a sim card that will cost you about 30 birr (March 2014). Ask a cell phone retailer (there are many of them, especially in the piazza). If the retailer does not sell them, he or she will point you in the right direction. Be prepared: you will need a passport sized picture and a photocopy of your passport that the seller will keep. The quickest way to get an own SIM card is probably in Hilton Hotel. If you have all needed documents (photocopy of your passport and two passport sized pictures), it will take you less than 5 minutes to get your SIM card. In Addis Ababa, especially in Bole Subcity, you can find quite a number of internet cafes. Some cafes still use Dial-Up connections, but broadband becomes more popular. Most of the high-end hotels have internet connections (either Ethernet or WiFi), which are reasonably fast and often free for hotel guests. A general problem about Internet in Ethiopia is the unstable international high-speed connection. If it is not working, even broadband cafes only deliver Dial-Up speeds and less. The local definition of highspeed broadband is 128kbits. Another general problem is the shortage of electricity, forcing daytime blackouts of whole areas 1-2 days a week, so it is good to plan ahead where you are going for internet access. During the winter months of 2009 (Jun-Aug), electricity had gone off on one side of the city for one day, and another side for the next. Skype and VoIP service are legal in Ethiopia. Broadband Internet in DH Geda Tower , next to Friendship City Center / Bole Road. 128kbps, many seats, but mostly completely occupied. The good thing is, that is is easy to find. DMG Internet Center, near Edna Mall next to Kaldi's Cafe just off Djibuti Street (the road leading from Tele Bole towards 22), has broadband connection and 11 terminals. 2 MB speed Internet, which translates to pretty decent speed for the country. Open Mon-Sat 8:30 am - 8:00 pm. 3G Internet services (known as WCDMA or UMTS) are available in many parts of Addis Ababa. A special SIM card and capable phone is needed. Price is 0.04 ETB Cents per 100 KB. Also CDMA is available, that needs special devices (prices around 0,10 ETB per Minute, around 128kbits). EVDO requires a USB device and is faster than CDMA but requires monthly payment of 500 ETB/month for 2 GB data plan. CDMA and EVDO are also available in all regional and most zonal capitals in Ethiopia. This page was last edited on 3 February 2019, at 08:30.